Year by year, kids movies come out in droves and a majority of the time they are pathetic attempts at scrounging any cash they can. However, the rare occasion happens when one manages to steal the hearts of kids all over the world and this series is a prime example. Back after two installments and one stand-alone film, we have the third installment with everyone’s favorite super-villain and yellow babbling minions, ‘Despicable Me 3′. Thus far, the series has been fun and entertaining; which is great considering most series’ lose steam at this point, especially kids films (I’m looking at you Shrek, Madagascar, etc). Although I did not see the stand-alone Minions film… Working at a theater destroyed any desire to see that film, but that is a story for another time. For now, let us get to the Oberrating of the newest Despicable Me! Another Despicable Me film, another satisfied outing for me. Since the start of the series and being delightfully joyed by the film, I go into these movies expecting outrageous antics generating a fun experience, crazed babble by the minions, and adult targeted humor for the parents bringing the kids to the theater and the child-at-heart young adults such as myself. ‘Despicable Me 3’ does exactly that once again while also still being relatively fresh and fun. Going into this movie whether you are the parent looking to entertain the kiddies, a young-adult satisfying your inner child, or hell, the veteran adult who is just looking for fun. This film is for anyone looking for some mind-numbing fun at the theater. However, this third installment may be the first one of the series where I have noticeable issues with certain elements of the film. One of those are the two side stories next to the main one of Gru and Dru teaming up. While the minions story-line still had plenty of funny moments, the story was barely a story as is and it felt like a desperate plug to show the minions because they are such a yearned for piece in this series. From my perspective, I feel as if they could have done the minions differently as far as their story went and still gave them plenty of screen time. Vice versa, there is a side story with the girls and Lucy that is barely memorable and also gives off the vibes of a desperate plug for screen time. 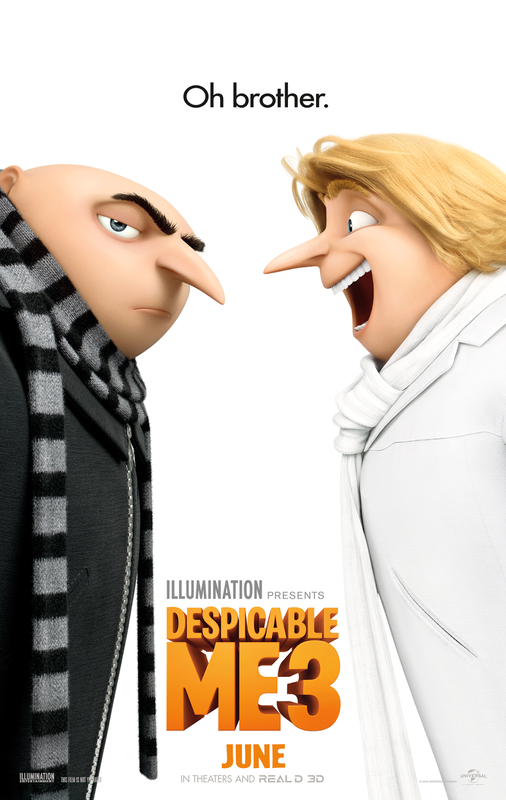 This movie is the Gru and Dru show but very clearly, the studio did what they could to give the other characters in the story some screen time but they are hardly memorable and noteworthy. A last point I feel is necessary to make is that this may be the worst villain of the series. I was not amused by Balthazar Bratt (voiced by Trey Parker) for what seemed to be the duration of the film. Bratt is a child star who failed to remain notable growing into adulthood and turned into an evil villain soon after said failure. His antics, dialogue, and just his overall character did not work for me. Lucy remains to be my favorite “villain” of the series. Bratt will fade from my memory besides being an overall annoyance. For any fan of this series, when broken down, ‘Despicable Me 3’ does exactly what it intends to do and what it has been doing; entertaining fans and creating a fun environment from start to finish. It is fun from the youngest of eyes to the oldest. Mindless jokes that will have the kiddos giggling in their chairs, adult jokes to get chuckles out of the parents, and crazy minion antics to make the whole crowd roar. Despite what could be seen as questionable story lines for some of our favorite characters, the main one with Gru and Dru is plenty of fun. Likewise, ignoring what is an unmemorable villain, this film is pure fun and that is all. Recommended for all, ‘Despicable Me 3’ is another notable piece to the series and I want more! Posted in 2017 Movies, Movie Review.Tagged 2017, Cinco Paul, Dana Gaier, Despicable Me, Despicable Me 3, Eric Guillon, Ken Daurio, Kristen Wiig, Kyle Balda, Miranda Cosgrove, Movie Blogger, Movie Reviews, Movies, Nev Scharrel, Pierre Coffin, Steve Carrell, Trey Parker.